Oh hi there! It has been a couple of weeks since I last posted and I felt a bit of a need to do some writing. I’d been in two minds about attempting Nano this month. And I actually sat down to make a start. But the decision has been largely taken out of my hands by circumstance. Post work fatigue, a massive (but delightful) wedding, and a few general responsibilities (like writing applications for new jobs) all conspired to make this a sub-optimal time to be writing fiction. It is not that I don’t have any ideas. I have about 5 stories already on the go, with notes and research for all of them – just waiting for me to pick up the keyboard and write. The wedding was specular by the way. An Irish dancing teacher marrying a Businessman? Both of them are really lovely people… and we expected the wedding to be quite a show. And a show it indeed was! Be warned – the camera girl screams out in excitement a far bit. As for the job applications, don’t get me wrong… I love my job. But like a lot almost every other role in my hospital at the moment, there’s absolutely no certainty that I will still have my job in 2 months time. So it is best seek out new opportunities in a market that is thin of opportunities, before I find the rug pulled from under me. I may still have my job in two months – so if you guys could cross your fingers for me, I’d be more appreciative. Anyway… I decided that I needed to thin out my typewriter herd a few weeks ago. I’d acquired a few machines that were rather less than inspiring typewriters, and I felt it was time to perhaps cut down a bit. As such I dipped my toe into selling on eBay with a machine was in perfect operating condition – and aesthetically in very good condition, compared to most of the machines on ebay. The reason I chose this machine was simply because it was a really uninspiring typewriter. Its action was too light for my typing style, and the edgy 70’s design of the machine matched nothing in my collective of typewriters. It even didn’t look right next to my 70’s Hermes. It was, of course my Imperial 220. The gaudy and boxy style was really not to my taste. It was a machine that was made at a time when the market was more inspired by the new computer technology that the had started to see fill back rooms in offices. I’d been looking for a typewriter that was designed in this era – something that captured the cobalt blue and sharp edge design that was iconic of computers at the time. And this machine sort of fit the bill. I bought it as a job lot actually. 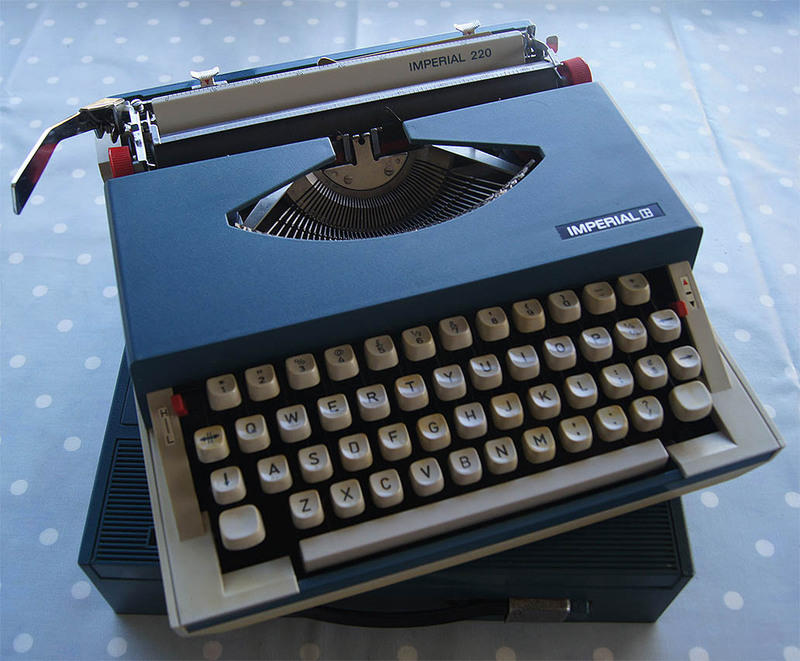 It came along with an Olivetti 32 which is going to be a gift to ‘Baroness’ – Once she gives me back my Hermes baby. But it was far from the machine I was looking for. Something along the lines of the Blue and bone Hermes 3000 of the time, or a blue Selectric would have been more ideal. They captured the design ethos far more accurately. So, the Imperial 220 had to go. I put it on ebay and the bidding was slow and steady. I’d serviced and cleaned this machine – which I had originally bought very cheaply, and I even put in a new ribbon. It was the ideal machine for someone wanting to get into typing. 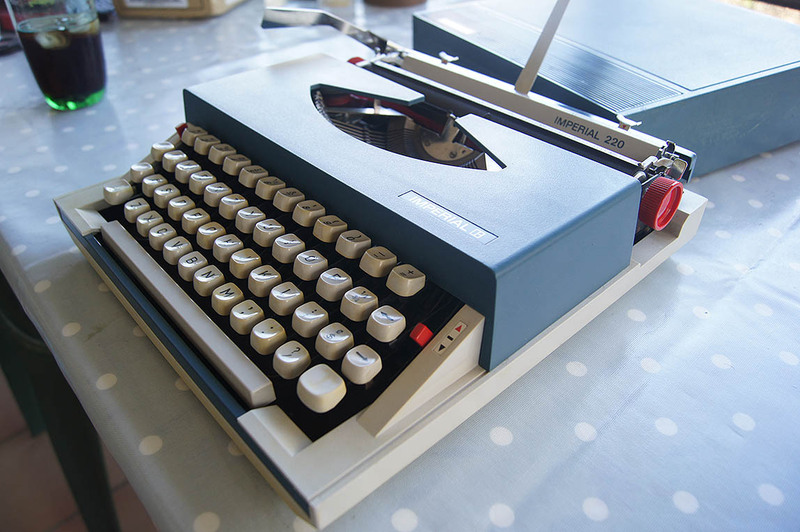 I even tried something different, and dual advertised it in the ‘Scrapbooking’ section of ebay – as I felt this lightweight typing machine could be more useful to a crafts person than a writer. As usual the last couple of days of the auction was where the real action happened. And it soon sold at a respectable price that made my efforts worth while. But as the final names and numbers came up, I noticed a very familiar name amongst them. ‘Oztypewriter’. He’d been beaten by a woman here in Queensland that lived over in the suburb of Annerly. He noticed my odd and comprehensive approach to selling this typewriter, and immediately messaged me after bidding had finished. If I had have known that Robert was looking for something like this, I would have just posted it over to him. But now it was already committed. However the woman that bought it was quite interesting. Annerly is only a couple of suburbs away from where I work, as opposed to the hour long drive that it would have been to where I live, and as such I suggested that we meet in my office. “Oh, what kind of show’? I asked. “We’re not sure yet. We’re still working on it” she answered with a hint of avoidance. “But this is going to become a flying typewriter”! she went on to explain with a glint of excitement in her eye. Before long she handed over the exact amount of money to me, and was gone. I imagined the Imperial strapped to the back of a scooter somewhere, having an exciting ride through ‘The Valley’ and across the Story bridge back to Annerly. Not that it wasn’t used to bikes, as it had come to work with me strapped to the back of my bike just a few hours earlier. I asked her to keep in contact with me about her show, as i would have loved to have seen the flying typewriter. But I wasn’t surprised that she hasn’t, as she seemed very much to avoid talking about it. I get the feeling that she thought a typewriter selling man that worked in an office in a hospital wouldn’t be her kind of audience. Shame really… I used to work as a theatrical stage manager – and even if it was to be used in a burlesque show, this would have still been great to see. I gave her the details to this blog, and she may swing past at some stage. We’ll see. November 9, 2012 in de-clutter, ebay, Imperial 220, reducing, selling, typewriter, wedding.. I know what you mean about having to thin the herd, Scott. I've become a little disenchanted with typewriters of late and have a couple of machines that will end up on eBay very soon. 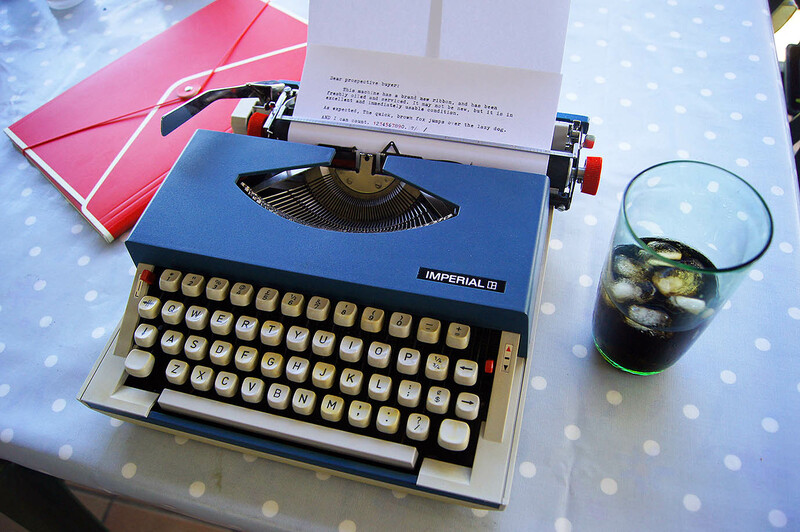 Better to have typewriters that you love to use rather than some that merely take up space. Best of luck, too, with your job hunting. No doubt you'll find something. It would be sad to see one of those Royal Sprite/Imperial 220's busted up on stage, if that's what the idea is, especially since it worked well after the time you put into fixing it up. I rather like these as typing machines, even if the shell design is goofy. Hmmmm … why do I have a feeling that this flying typewriter is going to make a crash landing? Flying? I think Richard has it right, crashing. Anyway you are not alone in thinning out the collection. I am still unloading some of mine to make room for some that I really want. Having too many on hand really can diminish your love for them. Also, you certainly can over do it. Will be interesting to see what you sell. I think I need to drop my collection down to 5 most loved machines. You know Ted…. I don't think it will be such a problem. I doubt that it will actually make it onto stage to be honest. And besides – she spent $50 on it, while there were plenty of other machines going for around the $10 mark. I don't think she'll be in a hurry to bust it up. I'm not so sure myself. As I said to Ted, she spent $50 on something that she could have bought cheaper – if she wasn't so interested in the condition. I didn't know you were! The problem is…. I've bought others since! Oh well…. Best to clear the ones you have no love for. How many? Ahhhhhhh……. Quite a lot. Incidentally, I have one of those Hermes Babys. And they're a great little machine. Epoca however, is quite rare.